Can any driving enthusiasts recommend valuable training videos? A NARHA member recently inquired about the availability of such educational tools. If you have a recommendation, please forward your responses and we will pass on the information to this and other NARHA members. You can now support NARHA on eBay! Donate 10 to 100 percent of any item up for sale and choose NARHA as your cause. Click here for more information. Markel is proud to continue to be a sponsor of NARHA. So many individuals have access to the healing spirit of the horse through NARHA centers and the caring people that make these programs work. Supporting NARHA is supporting opportunities for all individuals to experience the freedom and the thrill of associating with a horse. Being involved with the NARHA community is exhilarating and uplifting. NARHA also offers a great second chance to horses that might otherwise be retired before they are truly ready. Most horses enjoy having a job, and becoming a program horse can extend a career in a most satisfying way. The joy riders express when involved in NARHA center activities is felt by their equine partners, and allows continued access to pampering and special treats that our special horses so enjoy. I have experienced my own tragedy recently and have found peace on my horse's back. Through my association with NARHA, I am able to experience the joys and successes of so many people. What has worked so well for so many is now working for me, and I am so thankful that I have Danny (my horse). Making that same magic available to the broad spectrum of NARHA clients is a wonder. NARHA is special people and special horses making special things happen every day. Contact Megan Ream to join Markel as a NARHA sponsor today! Philip Tedeschi will be sharing his stories and research at the 2011 NARHA National Conference and Annual Meeting luncheon, November 10, 2011, in Lexington, KY.
Phil is an Animal-Assisted Social Work and Experiential Therapy Specialist and co-founder of the Institute for Human-Animal Connction programs at the University of Denver in Colorado. He coordinates the Graduate Studies in Social Work's Animal-Assisted Social Work Certificate program and teaches forensic social work and experiential therapy approaches at D.U. A NARHA certified Master Therapeutic Riding Instructor and former course director/instructor with Outward Bound, Phil has many years of experience in non-traditional therapeutic approaches with children, adults and families. He served in the past on the NARHA Medical Committee and was co-chair of the NARHA Research Committee. 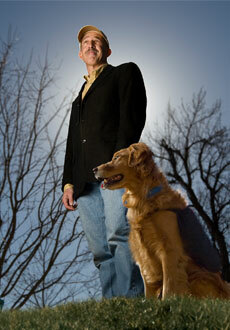 Phil has been a presenter at numerous conferences and workshops on the connection between humans and animals, including at the 2010 NARHA National Conference. One attendee writing about the desire to have Tedeschi as a keynote speaker at this year's conference said, "His presentation on 'The Ethics of Human Animal Interaction' should be heard by everyone at the entire NARHA conference." Look for more information coming soon on Phil and other speakers and workshops. And watch your mailbox at the end of June and beginning of July for NARHA's Strides magazine with the 2011 national conference and annual meeting registration book! We are very excited to be able to offer our members a limited-time special registration fee for the 2011 NARHA National Conference and Annual Meeting. 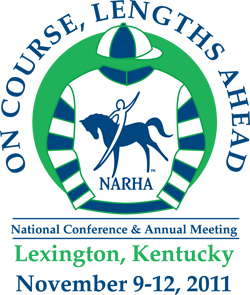 The limited-time online registration fee is $475 for NARHA members. You won't be able to pick sessions yet, but we know that this conference will be an extraordinary experience that will include enhanced educational content, the annual awards banquet and the horse expo, which will be held at the beautiful Kentucky Horse Park. You will have the opportunity to select specific sessions once they become available. This offer is only available via online registration. No phone or fax orders will be accepted. Official online conference registration will begin in the summer of 2011. The 2011 summer issue of NARHA's Strides magazine will also include the hard-copy registration booklet for those preferring to register via fax or mail. This limited-time offer cannot be combined with any other discount offers (including the discount for Premier Accredited Centers). The offer expires July 5, 2011. Book a room at the Hyatt Regency Lexington: (859) 253-1234 or click here to reserve a room online. Use code g-NARH. NARHA knows its current members are the best possible source for new members who could benefit from all NARHA has to offer. With our special Member-Get-A-Member drive, we've made referring colleagues to NARHA easier than ever! Click here to learn program details! Pat McCowan purchased a NARHA membership for her daughter Sierra, who is 14 now and volunteers at Little Bit in Woodinville, WA. She will be the 3rd generation of NARHA members in the McCowan family. Pat said that Sierra will more than likely attend the national conference in November. Thanks, Pat, for getting NARHA another member in the Member-Get-A-Member Drive. Update from last month regarding the EFMHA Yahoo Group: The Membership Oversight Committee has agreed to the recommendation of Brad Lewis, and, therefore, the EFMHA Yahoo Group will become an independent and open list with a new name! We have been hard at work on a number of tasks, all of which involve providing consistent, professional explanations, guidelines and general language about EFP and EFL. Work is ongoing on updated and new products, updated website information and new membership benefits specific to EFP and EFL. In case you are not familiar with the make-up of our task force, please be sure to read through the biographies of the members who are working hard to make sure the association truly represents the EFP and EFL communities. As always, if you are interested in learning more about any of the projects we are currently working on, or have concerns, questions or ideas related to EFP or EFL, please don't hesitate to email! The NARHA Standards for Certification and Accreditation manual has grown and evolved with new programs added over the years. Standards have been added and rewritten to fit the needs of the new programs. The time has come to evaluate and reorganize the manual to bring it up to best practices and make it easier to interpret and implement. In February 2011, the Equine Welfare Task Force officially became a NARHA standing committee - the Equine Welfare Committee. The committee seeks enthusiastic, open-minded, dedicated individual members to join us in supporting our equine partners and other animals that may assist us in our unique fields. Things happen. Unexpected stimilus, bee stings or other unforeseen incidents can happen while your horse is hitched up. Horses, being prey animals, are naturally claustrophobic. If they feel trapped while being threatened or scared, to the point of flight, they can seriously injure themselves or anyone nearby. Here are a few thoughts on how to help prevent this from happening at your facility. Not unlike duct tape, baling twine has many different uses. Here is one idea on how to "recycle" the twine that seems to collect around most barns. Once your horse has been trained to give to pressure, you can avoid serious injury by adding a piece of baling twine to your stationary hitching areas. The baling twine remains attached to your cross tie rings or hitching rail. You simply then hang your cross ties, or your lead rope, to the twine. If you are using cross ties be sure to attach the panic release snap to the twine and not to your horse's head. If he is in a panic, you may be injured trying to get to his head. It is best to release him from a distance, if necessary. Using the twine allows the horse to break free if he ends up in a panic situation, reducing the chance of serious injury. There are a few items on the market that also help to make tying your horse more safe. One of these items is known as the "Blocker" ring. This neat little device offers a few different tying options. Some of the options allow the leadline to release as the horse pulls back, but in a much slower manner. Therefore, if he pulls back in a panic he experiences a slow release and not firm resistance. I also recommend avoiding cross ties made of stretchy materials. If stretched beyond their capacity they can break. The result can be a dangerous, fast moving, whipping piece of material ricocheting around the horse and human, possibly causing serious injury. Lastly, please be sure that every horse handler at your facility knows how to tie their horses up with a safety release knot. When the leadline is tied in this manner the handler can quickly release the horse if the need arises. As previously communicated, NARHA is proceeding with great enthusiasm and plans to announce a new association name in late June. In the meantime, we have received a few calls in the office regarding what will be expected of centers. Hopefully we can answer a question or two here. Centers will be encouraged to update their websites and printed materials to include the new association logo. Centers will receive new electronic versions of the logo on their 2011 Standards for Certification and Accreditation manual CDs, and logos will be available online for download. Centers have the freedom to update their materials as current supplies are exhausted and capacity allows. Centers are definitely NOT required to implement the change immediately. Announcing to the world the new, contemporary and accurately reflective name for your association should be great fun. It is not intended to create hardships for any centers or members, instead it will hopefully help you better explain the wonderful services your center offers. In fact, as we plan comprehensive media outreach to announce the launch, we encourage the centers to start thinking about the same thing. We plan to capitalize on this newsworthy moment, and by doing so reach targeted markets we may previously have missed. Centers will receive a press release template that can be customized and sent to their local media contacts. All we ask is that you do what you can to include the new name and logo, whenever you can. Watch your mailbox for surprises and more launch information coming soon! This is an exhilarating time to be part of an amazing industry. Thank you to everyone who has played a role in making this association what it is and for helping with the naming process. Stay tuned! Please be aware that there has been an EHV/EHM Equine Herpes Virus (Rhinopneumonitis) outbreak in Utah, Idaho, and along the Front Range (Colorado). Equine herpesvirus myeloencephalopathy (EHM) is another name for the neurologic disease associated with equine herpesvirus (EHV) infections. Neurological signs appear as a result of damage to blood vessels in the brain and spinal cord associated with EHV infection. Interference with the blood supply leads to tissue damage and a subsequent loss in normal function of areas in the brain and spinal cord. Horses may appear to be perfectly healthy yet spread the virus via the secretions from their nostrils. If you have any concern as to whether your horses may have been exposed, you can start by taking the horses temperature twice a day and while doing so make the horse yield the hind end away from you to see if there is any loss of coordination. If your horse is showing flu like symptoms, a temperature over 101.5 degrees and/or any neurologic symptoms, call your veterinarian right away. Information provided by Countryside Large Animal Vet Service. For more information visit http://www.aphis.usda.gov/. Unless otherwise noted, contact Abigail Hendren at (800) 369-7433, ext. 104 for further information. All dates are subject to change. To register for an event, please contact the host site directly. You can locate their contact information under the Find a Center link on the NARHA home page or on the NARHA events calendar. If you are interested in attending, please call the center immediately and reserve your spot. We are in need of more attendees for this event. If you wish to attend, please call the center and get your spot paid for! All reserved spots will be confirmed with an email confirmation providing you with the application and informing you where to send your application materials. If you are interested in attending, please call the center immediately. The driving demo workshops do count toward gaining NARHA driving certification. Please visit the NARHA calendar for a list of 2011 Registered On-Site Workshops and Certifications.